American Assassin The gun says trained killer but the shades say Mayor of Flavortown. Mother! When everybody else is chumming around with Sean Spicer. AMERICAN ASSASSIN. Solid, straight-ahead action pictures seem ever rarer in a field dominated by costumed heroes, horror and animation. It may well be that their day has passed, that the genre has been relegated to the digital equivalent of "straight-to-video," where Nicolas Cage can reign, in ridiculous repose, as the king of the dusty, virtual shelves. The argument could be made that, with the real world moving ever closer to apparently inevitable geo-political collapse, with violence large and small, at home and abroad, so prevalent that it threatens to become normalized, action pictures can too often remind us of things we'd just as soon go to the movies to forget. I can't say that I subscribe to this theory, at least not entirely. But I believe that violence in cinema, particularly when placed in a "real world" setting requires delicate, deliberate handling in order to convey any authenticity or resonance, to avoid ridiculousness and grotesquerie. American Assassin makes a run at it, but stumbles and falls short of achieving any real impact. Mitch, surprisingly adept at languages, the navigation of the Dark Web, hand-to-hand combat and marksmanship, trains himself up as a one-man counter-terrorism unit. In less than two years, he locates and begins to infiltrate the organization responsible for Katrina's death, but the CIA intervenes before he can get his justice. His movements have brought him to the attention of Deputy Director Irene Kennedy (Sanaa Lathan), who thinks he'd be just perfect, given a little polishing, as one of her invisible assassins. She sends him off to a woodsy training facility run by tough-as-nails Stan Hurley (Michael Keaton), where Mitch's fire and tenacity mark him both as an asset and a liability. Soon enough, they're off on the hunt for some purloined nuclear materials. The Iranians are involved. So is Hurley's former protégé (Taylor Kitsch). Things go just about exactly as one would expect. American Assassin is drawn from one in a long series of novels by Vince Flynn, whom I must admit I haven't read. As I understand it, though, the source material goes back a few decades. And despite efforts to update and modernize it, the resulting movie still feels like the post-Cold War action thrillers with which movie-houses and supermarket shelves alike were so filled back when. But we've come too far, culturally, artistically and otherwise, for the old formula to work. While Assassin may be a little more stylish and better acted than one might expect — credit due to the cast and director Michael Cuesta — it is neither fanciful nor realistic enough to fully succeed. It feels like it was based on a book one's dad would read on vacation, if one's dad didn't particularly like books; and it was. R. 111m. BROADWAY, FORTUNA, MILL CREEK. MOTHER! I have no doubt that Darren Aronofsky's mind is a brilliant one. Trouble is, I don't think he doubts it either. And so he persists in making ever bolder, ever more metaphorical horror head trips that, while evincing masterful cinematic technique, also alienate more of the audience than they draw in. This is not to suggest that challenging, defiant art should not have its place in the greater cultural conversation. Rather, I'm concerned that Aronofsky's wacky, cerebral creations may get both too little and too much attention for their intellectual theatrics. Some will write them off as over their heads, others will condemn them as pretentious. And nobody's wrong. I admire Aronofsky's apparent fearlessness, the audacity and grandness of his vision. But the risk inherent in such bold gestures lies in their proximity to pretentiousness and hubris. It takes no small amount of artistic courage and self-confidence to make movies like he does, but is that justification enough for their existence? Hard to say from this near distance. The lead-up advertising for Mother!, elliptical and cryptic, intentionally avoids much exposition because it would spoil the greater effect (an effect which, to my eye, is actually pretty successful). 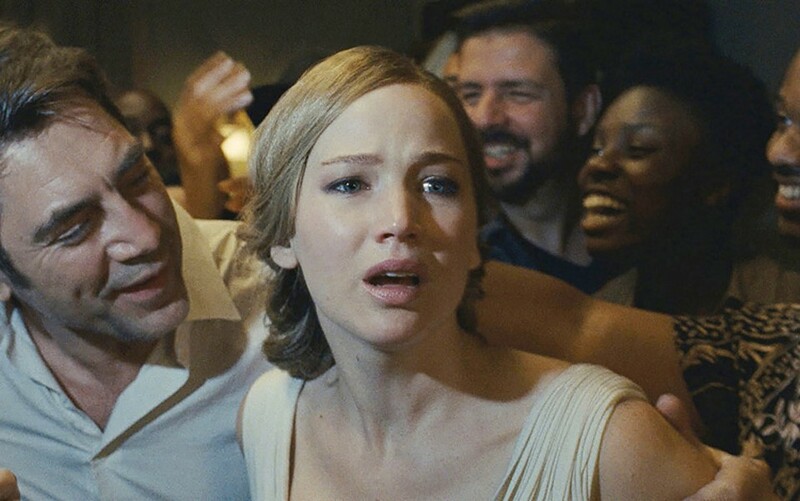 The movie, as advertised, tells the story of a couple, played by Jennifer Lawrence and Javier Bardem, settling into a rambling country home that she is in the process of renovating. They are visited by strong-willed strangers (Michelle Pfeiffer and Ed Harris), whose presence their hostess comes to find increasingly troubling. From there, things get batshit crazy. There will long be debate, I think, as to whether this movie represents reach exceeding grasp. Its multi-layered allegorical storytelling borders on intellectual masturbation. For me though, its technical, cinematic successes outweigh what some will call the failures of its narrative. The soundtrack, nearly devoid of music, is a masterpiece of sound design: The old house surges and groans with the suggestion of bad things to come, every object in it seemingly capable of noise. And Aronofsky, with his longtime director of photography Matthew Libatique, finds a balance of freneticism and stillness in the visual style that pairs perfectly with its subject. The actors, not surprisingly, give deeply troubling, raw, high-wire performances. All of the elements cohere to produce an immersive, enervating experience that, to me, should be forgiven the grandiosity of its ideas. R. 123m. BROADWAY, MINOR. KINGSMAN: THE GOLDEN CIRCLE. The sartorially obsessed society of spies loses its digs and is forced to team up with its American cowboy-drag counterparts. With Colin Firth, Taron Egerton and a glowingly evil Julianne Moore. R. 141m. BROADWAY, FORTUNA, MILL CREEK, MINOR. TO CATCH A THIEF (1955). Cary Grant plays a retired cat burglar who crosses the path of a socialite (Grace Kelly) on the French Riviera in this Hitchcock classic. PG. 106m. BROADWAY. COLUMBUS. John Cho graces us with his bone structure as a man visiting his comatose father in an Indiana hospital, where he meets a young woman (Haley Lu Richardson) who's put her ambitions on hold for her recovering addict mother in this comedy/drama/romance. R. 100m. MINOR. DAVE MADE A MAZE. A frustrated artist is trapped in his own living room installation. Starring Meera Rohit Kumbhani, Nick Thune and Adam Busch. TV14. 80m. MINIPLEX. THE GIRL WITHOUT HANDS. German animated fairy tale about a girl who escapes the devil at the cost of her hands. PG13. 100m. MINIPLEX. THE HITMAN'S BODYGUARD. Ryan Reynolds and Samuel L. Jackson bring back the buddy movie with their collective charisma and sharp repartee. Salma Hayek is a vicious delight and the movie has action and enough jokes to entertain throughout. PG. 91m. BROADWAY. LEAP! Elle Fanning voices a would-be ballerina who runs away from her orphanage and sneaks into the Paris Opera in this animated dance off. PG13. 100m. BROADWAY. WHOSE STREETS? Documentary about protest and activists in Ferguson, Missouri, after the police killing of Michael Brown, an African American teenager. R. 90m. MINIPLEX. WIND RIVER. A snowbound and sadly lyrical thriller about an FBI agent and a hunter investigating a murder on a Native American reservation. Starring Jeremy Renner, Elizabeth Olsen and Graham Greene. R. 107m. BROADWAY.